That's the response I got from the cashier when I returned to my local market for the third time in three days. That's what she said when I gently placed my nine red bell peppers on the conveyor belt. That's after having bought six the previous day and three before that, all with the same cashier. Does she ever go home? I took umbrage neither to her eye rolling nor to her indelicate handling of my pristine peppers. If she doesn't realize the mind-blazing deal of red bell peppers 3 for $1, then I can't help her. 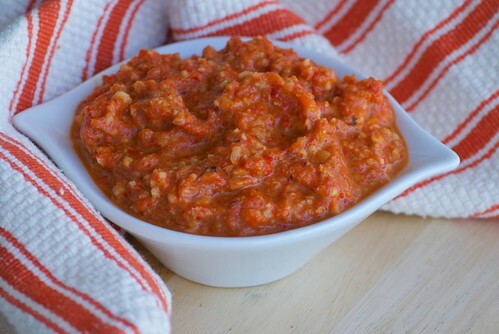 I also won't be sharing my garlicky roasted red pepper and almond dip with her. So, there. This recipe is inspired by my friend Simona from the authentically Italian blog, Briciole. If you don't know Simona, then I suggest you visit her. You'll feel like you just spent some time under the Tuscan sun. Makes just over 1 cup. 1. In a small pan over medium-low heat, warm olive oil. Add red pepper flakes and sliced garlic, and saute until golden and fragrant, about 3 minutes. Keep an eye on it, as it can burn quickly! Remove from heat. 2. Grind almonds in a food processor. Add garlic-oil, roasted red peppers, vinegar and a pinch of salt. Process until a thick sauce forms. Taste, and salt as desired. Cover and refrigerate, but bring to room temperature before serving. At that price for red peppers, you should be exporting to Rhode Island! I'd go to the market three times in week, too. Love the sound of this dip and can't wait to try it. This dip looks great! Thanks for sharing the recipe. Wow, I am positive I've never seen red bell peppers as cheap as 3/$1! What a find. Obviously that cashier is not a cook. The dip sounds outstanding, even if you had to pay a bit more for the peppers! I would have done exactly the same thing you did. You can roast a big batch of peppers and then use some and freeze the rest. You put those peppers to great use. I am honored to have played a small part in this adventure :) This is actually my favorite dip and it is so cheerful to have a bowl of it in the middle of the table! I sometimes feel like the cashiers at Target may want to give me the 'back again' look sometimes. But then I want to give it right back to them. They must have a pull out cot underneath their cash register. This dip looks so flavorful! THREE for a DOLLAR?!?!? That's a steal. I'd be buying them ten at a time! This dip sounds delicious...definitely the perfect use for those peppers. Where do you find red bell peppers at 3 for 1$!! Thanks for sharing the other recipes too. There are several that I'm eager to give a go. 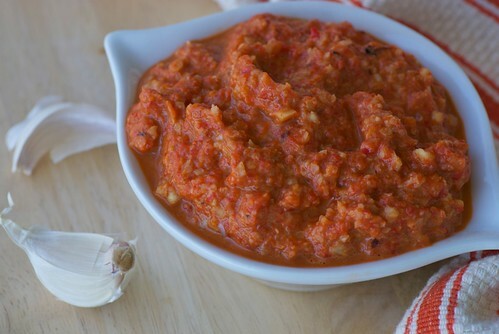 This reminds me of the Spanish Romesco Sauce. Mmmmmm, delicious! Well worth another trip and running the gauntlet of Miss Smarmy Pants! Would be wonderful on bruschetta or pasta. Hi! Roasted red peppers are listed twice in step 2, is one supposed be be the balsamic vinegar?? This sounds awesome btw! Thanks! kalyn-No, I don't think she is a cook. simona-And I'm so thankful for your inspiration. I served it to company, and they literally couldn't stop eating it. Grazie, my friend! julia-You'd think that they'd be happy we're back. It's better for business. dany-There were at Sprouts. Do you live in San Diego? jacqueline - Ms. Smarmy Pants. :) I haven't had it on pasta yet, but I'm sure it'll be fabulous. ashley-Yes, and thanks for catching that. I just corrected it. not only a great deal, but what looks like the perfect way to use them! I can't wait to try this! What a beautiful dish, Susan. Red bells are really inexpensive up here right now also, but not anywhere close your find. Still, I'll be making this today. And maybe even have Simona give it a try! Roasted red peppers are excellent! We eat them a lot in Greece and this dip is something I would gladly have over a slice of warm bread! You have a beautiful blog! What a great deal indeed and a really interesting recipe! Sounds delicious and it also sounds like it would be great on sandwiches. I have to try this. This dish doesn't have to be shared, does it? Looks so good! Could you replace the red peppers with eggplant? aman-Yes, salty feta would be a wonderful addition. hornsfan-I like the way you think. jill-I can tell you from experience that it is great on sandwiches. brook- Sure you could. Eggplant would be delicious! susan, i had to come back here, made this dip twice in a week! it was the biggest hit at family dinner, then with a potluck at my crossfit gym (i've had to share the recipe three times since thursday!!). this is amazing :) however i did make a change, for ease i just used almond meal (bob's red mill) instead of grinding my own almonds, worked like a charm and tasted great too! hornsfan-Aren't you sweet! Thanks for letting me know it was such a hit. And I'm happy to see your sub of almond meal worked. Good to know! Love that you added almonds to the dip! Sounds great!